So today was the day of that big march of “freedom loving people” on Washington, DC, to take the government back from the rest of us freedom loving people. Some title the march “Walk like an Egyptian,” a not-too-subtle reference to removing a government through popular uprising. we can do the same here, but we need millions and millions to stand up go to Washington , and have our military stand with we the people & the constitution once and for all ! March On Washington D.C. September 9th 2013. We ARE going to DEMAND it! I have walked from the monument to the white house down around the capital building and have not found anyone from the march yet but ran into a lot of good people. 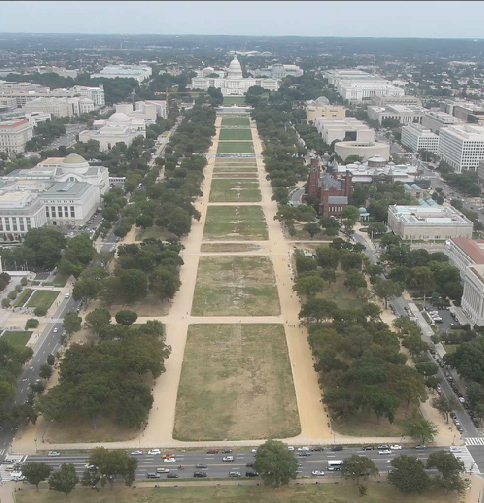 Here’s the view of the National Mall from the Washington Monument at 3:48 PM. What if they held a revolution and nobody came? OMG! I just remembered that today is the day! It’s finally come! Today “We the People,” led by uber-patriot Bobby Powell, are taking back our government! Remember what the Western Center for Journalism said about this day? So all you Obots, I hope you are enjoying your last day of freedom! The day of reckoning is at hand! Tremble and be afraid! Fogbow has some hilarious Facebook posts from people at the “rally” looking for it, and embarrassed admissions from would-be attendees that they could not make it. No sign of hordes of angry police chiefs yet. Looks like business as usual in DC. I remember when I was a kid, there was a nutter named William Depperman, who slapped enormous left-wing conspiracy theory posters around Manhattan, on walls, with oceans of 11-point Courier type, spouting the most incredible drivel. They were on my route to and from school, so I would look at them while I waited for the traffic light to change. This fella denounced everybody as a CIA stooge, and said that karate actor Bruce Lee’s death was a government conspiracy. He denounced just about everybody as part of the plot, which involved the JFK assassination, the 1980 transit strike, a Mark Lane talk at NYU, and on and on and on. His posters drew the attention of Mayor Ed Koch one day, as he was driving in his limo, and Koch saw these ghastly ugly posters defacing walls and phone booths. He told the police to investigate, so they did, sending in an undercover guy to join Depperman’s one-man political party, and catch him in the act. Which the cop did. Depperman got arrested and went into the system for the misdemeanor, got his Desk Appearance Ticket, and went back to slapping up posters. His next posters demanded that the masses demonstrate in front of the County Courthouse on the day of the trial. After the trial, new posters went up on the walls. These complained that the trial had been delayed three times by government chicanery, and whined that every day that a protest had been scheduled, it had rained, which prevented anyone from attending the protest. The poster further noted that the government had admitted to seeding clouds in Vietnam to create thunderstorms and flooding. Depperman was clearly accusing the US government of preventing him from holding a mass protest of millions of supporters by deliberately causing a thundershower on it. I could think of a lot simpler and cheaper ways that Uncle Sam could, if it gave a flying frazzoo, prevent millions of people from marching on the courthouse to demand Depperman’s release, but it was obvious to me (if not Depperman) that the reality of the situation was that nobody besides Depperman cared about his plight, either, and the paranoid idiot needed and excuse for the non-rally’s non-existence. So he picked on the silliest one he could find…bad weather. I guess nobody pointed out to him that the Long March wasn’t held up by snow, rain, or gloom of night…whining about the rain was pretty sophomoric. I never got the chance to point that out to him, because a few weeks later, his posters stopped appearing, but a Village Voice writer did an article about this daffy character and his whole case. The writer was mostly interested in Depperman’s fascination with Bruce Lee as a revolutionary who needed to be whacked by the capitalists. The article said that after paying his fines and being put on probation, Mr. Depperman fled New York City for somewhere in New England, and that was the last I ever heard of him. But his argument…that his grand million-man protest against government oppression (in the form of a DAT) was defeated by rain — and government-produced rain, at that — always kept me in stitches. That had to be the silliest excuse for failure I ever saw. It made the “dog ate the homework” excuse look realistic. How dare you use photographic “evidence” to mock us! If it wasn’t for Al Linskey, you Obots wouldn’t know what sarcasm was! Organizing a movement like that is a momumental undertaking. It takes literally millions and millions of dollars to organize such a movement whether it be birther or not. john: Organizing a movement like that is a momumental undertaking. It takes literally millions and millions of dollars to organize such a movement whether it be birther or not. Organizing a movement like that is a momumental undertaking.It takes literally millions and millions of dollars to organize such a movement whether it be birther or not. so, how many people were they short of their expected millions? Remember that re-doing the Capitol lawn was one of the first projects that Obama proposed? It was something that was needed (as you can see in that photo) and everyone could get behind but Obama-deranged Wingnuts opposed it because SOCIALISM! The photo shows that it is indeed being re-done and, according to a friend, is being done using advanced technology and environmentally-friendly solutions. Source: Abraham Lincoln, Mark Twain, whoever. ORYR, Kerchner, etc. yanked the triumphant video of Rep. Woodall blowing off Zullo. I think the turnout was low/non-existent because people don’t really fear that their guns are going to be taken away or that the government is tyrannical. I was writing this article while you were commenting. Has anyone noticed that the 2nd Amendment absolutists are also absolutely opposed to reproductive freedom? They are also absolutely opposed to the 1st Amendment, but I’ve read they’ll make an exception for the Jewish people. So on the bright side for them, it looks like they did outnumber the attendance of every DC birther rally ever held, combined. You guys can’t see the millions of patriots dressed as ninjas? What do you think, John: total idiot or pathetic grifter? Guess we’ll never know until ol’ Bobby reveals how much his scam took in. does he KNOW he works with JEWS? It looks like they had ten people there. I was part of a group of 12 people who spent the weekend at the Jersey shore, and all it cost us to organize it was a few e-mails and phone calls. Rickey: It looks like they had ten people there. I was part of a group of 12 people who spent the weekend at the Jersey shore, and all it cost us to organize it was a few e-mails and phone calls. Yep. It seems pretty obvious that birtherism is little more than an internet rant club. I see, John. Just reviewing your expert opinion, it would take millions and millions of dollars organizationally for the organizers to get millions and millions of people who want Obama impeached to show up for the rally. What was the number of angry Obama haters who the organizer actually got to show up? That’s ZERO ATTENDANCE, John! Straight from the organizer’s mouth! Nobody came, John! Nobody! Using your formula, if they spent $1 on publicity, they should have drawn at least an entire person! And where were the true believers that always join any real populist movement, John? Where were the 4 and one-half adults in this country who really believe Obama is an Usurper and that his online informational PDF file that truly conveys the officially confirmed vital birth information from his Hawaiian birth certificate, is instead a “forgery” that makes the likeness’ creator a felon – where are those folks today if they really believe the crazy Birther charges that together with an idiotically alleged stolen security number and a forged selective service registration card, these lunatic ravings constitute ample evidence pointing at the “biggest scandal in the history of the United States of America”? Double check! How many attended, again? Count them on your fingers, John! Take the populist temperature of the rotting and pathetically unsupported movement which the silly likes of you can serve as a kind of champion-substitute – your triumph has been in becoming the Birther equivalent of Hamburger Helper. You’ve taught us all the rule of Birther Football. To Birthers, moving the goal posts is the only way touchdowns are scored. So, another one of your heroes turns out to be a zero*. But does that stop you from making excuse for them? Hell no! *I deeply apologize to the number zero. It isn’t fair to lump it in with scum like Kessler and Zullo. And in all fairness, John probably can’t even count that high. A couple of reasons why people said they couldn’t Walk Like Egyptians today. It is with a very sad heart and deflated spirit that I must tell you all that I can not make it My daughter had to go to Fort Bragg, N.C. and I have to stay with my grandson. I guess there is a good reason why God doesn’t want me there. I don’t want to sound disrespectful, but: Tea Party God seems like kind of a jerk, you know? Couldn’t He have just left John and Joy notes, maybe burnt into their toast at breakfast? But no, He has to go break the guy’s car and inconvenience innocent family members to keep them away. And if He had to bust John’s ride, couldn’t He have done it in John’s driveway instead of making him drive a piece, first? justlw: I don’t want to be disrespectful, but: Tea Party God seems like kind of a jerk, you know? And if He had to bust John’s car, couldn’t he have done it in John’s driveway instead of making him drive a piece, first? Arthur: Yep. It seems pretty obvious that birtherism is little more than an internet rant club. My small town in PA, population 2,030 at the 2010 census, had two protestors with an impeach Obama sign walking in front of our busiest convenience store. Does this count? He’ll never learn how to buy wholesale. Suspiciously, the mall looks far emptier than usual, in my experience. It’s bad enough to throw a revolution and have no one show, but to throw a revolution and have everyone run away…! Perhaps their chief weapon is surprise, and today was a feint? PS — I have not been to the mall since the ’90s, perhaps the security situation has changed? I suppose they could blame the weather, but I’ve been there in the heat of July and there were plenty of diehards about. PPS — “Walk like an Egyptian”? Cripes. Do they also admire the giving the country to the military bit? Oh crap, being devotees of the Winger Military Cult, they probably think that’s a great idea. The irony … dreaming of overthrowing imaginary martial law in favor of …. actual martial law. Benji Franklin: Nobody came, John! Nobody! Using your formula, if they spent $1 on publicity, they should have drawn at least an entire person! And where were the true believers that always join any real populist movement, John? “9th Day 1, Monday: Demand OUR Right for a Redress of Grievances. A redress properly done INSIDE the Capitol Hill building, not just a protest out on the sidewalk. We will select our group leaders to go inside. Inside will be televised, and we expect our Congressmen of both Houses to be sitting in their seats LISTENING TO US WHEN WE HAVE THE FLOOR…. a. The House of Representatives must by the end of day vote to Impeach President Obama by a simple majority vote. b. The Senate must by end of Day pass by a 3/4th vote for OUR Anti-Bribery Amendment (not a bill to be later forgotten) so neither politicians nor political parties will be paid or get campaign contributions to change our laws. c. The Senate must pass by a 3/4th vote on OUR American Equality Amendment to insure ALL Politicians hereafter obey ALL our own laws without any retirements except towards current public programs open to all United States citizens. a. The House must complete a 3/4th vote to pass OUR Anti-Bribery Amendment. b. The House must complete a 3/4th vote to pass OUR American Equality Amendment. c. The Senate must start Impeachment proceedings. “They will work through the weekend, and every day thereafter until we are all heard.” Did this idiot ever stop to think that if a million people actually came to this event, and they were all given a chance to complain to their representatives, most of the attendees would be dead before they ever got a chance to speak? misha marinsky: He’ll never learn how to buy wholesale. (And we all know that there are French Armenians – like the great CA himself – so do not take it too literally). Where’s all the port-a-potties they will be needing when the millions show up? Police barriers? Refreshment stands? Relay speakers? Security? Emergency medical facilities? What the heck do these people think they are doing? Looks like they couldn’t organize a piss-up in a brewery to me. Obviously, the organizers wouldn’t be able to figure out how to pour water out of a boot if you wrote the instructions on the heel. Ahhhhhhh, buts it is all a cunning plan by the RWNJ’s…This was a feint and ploy as the REAL deal is the Million (or is it 2 Million) biker rally on 9/11…..fooled ya.. Seems originally it was a simple 9/11 drive through as has happend previously to commemerate the victims of 9/11 and the military. Probable headcount a couple of thousand. Then them Ebil Mooslems horned in with the “Million Moslem March” or more correctly “Million American March Against Fear”. Of course as with any rally of any ilk, the name disn’t QUITE reflect on ground expectations with……. The march also appears to have been bolstered by initially some 9/11 truthers and then folks with very understandable issues around the ever increasing Big Brother environment we are living in. Naturally, as soon as some sort of Damn Fine Patriotism reared it’s head, the various tribes of Wingnuttia all decided that the ACTUAL rally was all about them and the various impeachments, hog tieing, tarring and feathering of Damned ‘Rat Lieberal Libtards etc. Inevitably, based on applying reality based facts, what will happen is, some bikers will turn out, drive to commemerate appropriately, there will be no marching of frogs, a small and semi literate group of mouth breathing placard wavers will babble about Benghazi, NWO, Syria, impeachmen and stuff and be soundly ignored. This will of course be the latest “success” and means that the Demon Prince will be out of office and used as an early Christmas tree decoration. Those people couldn’t organize a bowel movement, let alone something with millions of people. looks like they had even less than they get at their `overpass protests’. One Russian is a revolution. Two Russians is the Kremlin. Three Russians is the Red Army. Four Russians is the Budapest String Quartet. i’ve already pissed of a lot of folks on stateside bike websites about showing a pavlovian response regarding the `million muslim march’ (of which the organisation trying to get it going has 9 members ) and the 2 million bike march. there’s something they also haven’t considered. if you ride side by side, it’s still over 300 miles! houston, i think we have a logistical problem! and it gets better, as 500,000 bikes in staggered formation would come out to about 1532 miles in length. there will be a turnout (mainly because bikers will use any excuse to ride together in a group and go for a beer after), but nothing as big as the dreamers want, even though the dog-whistle word `muslim’ has been used. oops! i also forgot to factor in the space needed for the recovery trucks. bob: ORYR, Kerchner, etc. yanked the triumphant video of Rep. Woodall blowing off Zullo. They sure did! And that act summarizes the brick wall of reality that the legally absurd Arpaio/Zullo/Gallups “forgery” premise disintegrates against when anyone who respects and knows the law, (in this case Representative Woodall, who has a law degree) can immediately sees how empty their false charges against Obama actually are. The fact that ORYR let the second clip, which was headlined with “On The Record: Rep. Woodall And Lt. Zullo Talk Obama ID Fraud; Phony Forged Document ” be seen at all suggests their editor is not getting enough sleep. That headline, in keeping with the core Birther principle of ‘always lie and misrepresent what has actually happened’, wants the reader to think there was a mutually reinforcing conversation between Zullo and Woodall embracing the notion that ID Fraud had been committed by or for Obama. The headline also gratuitously adds the expression “Phony Forged Documents”, exhibiting yet another common Birther assault on logic, the fallacious assignment of existential import to an unproven assertion, by just mentioning it as though it is a proven fact. The Obama-hating CCP crowd begins by prepostering that they started on this project to prove that the birth certificate was legitimate! Yeah, sure. Their real goal is to conflate the laws that forbid the production of likenesses of currency and which outlaw the use of forged identity documents to intentionally defraud a person, with the White House’s perfectly legal production of an informational PDF file placed online that faithfully showed what his vital birth information was, as confirmed by the State of Hawaii. Zullo goes on and on to Woodal about how anomalies verify that such a PDF file is a “forgery” and worries out loud to the Representative, about how this likeness published online, was not itself conveyed by an unbroken chain of custody after leaving Hawaii. That’s absurd on its face, since the likeness created at the Whitehouse, was never in Hawaii, and anyway, only purported to accurately reflect the birth information on the original in Hawaii. Woodall runs out of patience listening at this point and states his disagreement with the document fraud charge much more forcibly than on the clip of the previous contact, (a few days earlier) in which he (Woodall) suggested that he thought that the Zullo/Gallup perspective was one that “misinterpreted” the PDF file and it’s intended purpose. In the second clip which you correctly noted, has been removed Woodall makes it a little clearer that it’s obvious that a fraudulent attempt to use the PDF illegally has not happened, when he responds to Zullo on the phone by proclaiming that the accusers are imagining an event (for example, Obama submitting the PDF to some governmental agency as identification) which simply never happened. I contend these Birthers also know that no crime has been committed. They simply hoped to get an embarrassing rumor mill campaign started that would go viral and wound the Obama Presidency somehow. They seek a Kangaroo Congressional Investigation hoping only that some embarrassing evidence of SOMETHING would be uncovered. What sad sack liars! Another one of their heralded VIP’s craps on their parade, so they immediately scrub the evidence of their hollow charges and their disagreeing VIP vanguard. NBC blew them out of the document fraud water with the Xerox explanation. Now another VIP confirms that their flawed premise couldn’t stay afloat their anyway. This mirrors their organized effort to conceal the race code errors reported by His Excellence and Most High, Mr. Z on July 17, 2012. The Birther leaders are as dishonest as they come. Their effort is not honorable. They are not seeking the truth. Eventually even the most ignorant Birther will realize they’ve been taken for a ride. Are you having a light bulb moment, John? I can give an eyewitness report as I was in a cab passing through the National Mall between 2 and 2:30 pm on Monday. We were not delayed by hordes of birthers. As far as I can tell, DC was pretty much running as normal and I only had the standard wait for a latte at the illy at M and New Hampshire. Curious George: The Birther leaders are as dishonest as they come. Their effort is not honorable. They are not seeking the truth. Here, however, I think you are being to optimistic. These sad-sack remnants are pretty much permanently stuck on stupid. Sure, some “may” eventually realize that they are being nothing but fleeced, but if they couldn’t figure that out by now….*sheesh*. I expect quite a few of them will remain doubling down on throwing their money away on these scams, no matter what and regardless of how irrelevant they are and how many false promises and endless failures their “birther leaders” shovel them John is probably one of them. I’ve learned from this whole experience that willful ignorance can be in unlimited supply… At some point, they’ll simply pass away, having wasted a good portion of their life, money, time on a nonsensical and meaningless hate cause. Their loss and the world will continue on, mostly without even noticing they were ever here or are gone. Curious George: Eventually even the most ignorant Birther will realize they’ve been taken for a ride. Are you having a light bulb moment, John? Wait, I fell asleep. is it over? Has the country been overthrown? Odd. It was such a good plan too. Or, if you want to be nasty, you could just call the whole flop “The 9/9 ‘Nein'”. Or, for the nerds in the audience, the “.000001M Moron March”. RanTalbott: Or, if you want to be nasty, you could just call the whole flop “The 9/9 ‘Nein’”. So then, when the flop is completed, its the 666? Ordinary citizens? I call them extraordinarily stupid, deranged, deluded. i left a post on ORYR passing comment on the huge turnout they got. What if this week was the Rapture, and the only true Christians were those who went to protest in DC? …including the missing million Muslims? Have I blown your mind? justlw: …including the missing million Muslims? Think of all the hummus going to waste! The number of visitors to the site nearly tripled yesterday, I think because of the link to this article from The Daily KOS. I know that The Bangles performed live (saw them in the summer of ’85), but they’re lip synching in this video (which is supposed to be a live performance). Notice that Debbi Peterson, the band’s drummer, isn’t sitting at her kit and no one is actually playing percussion. Also, there’s no sign of a keyboard player. Finally, their guitars show no evidence of being plugged into amps. Nevertheless, a fun band for summer vacation frolics–and they’re still performing. Basically it’s been a weak turnout in response to a non-existing turnout. The problem with wingnuts is that they always love to generalize in order to build straw men. If three guys in their basement dream up a “Million Muslim March”, their right-wing counterparts act as if the Pope himself had called on all Catholics to attend. If some guy in a cave in Papoopistan croaks “kill all Mericans”, they claim “Islam declares war on US”. If some Democrat in Lost Marbles, TX, says “maybe we should not give guns to children”, they go “Democrat Party demands nullification of 2nd Amendment” and so on. Well said on all points! The Magic M: Basically it’s been a weak turnout in response to a non-existing turnout.